The life of Seymour Crawford, a long-time Fine Gael TD for Monaghan and former vice-president of the Irish Farmers’ Association, was celebrated at his home village in Newbliss, Co Monaghan. A large crowd of local people formed a guard of honour as his remains arrived at the village Presbyterian Church. Rt Rev Dr Charles McMullen, Moderator of the Presbyterian Church in Ireland, played a glowing tribute to Mr Crawford who died last Saturday aged 74. Dr McMullen noted that he had served the church in a number of capacities throughout his life. “His manner and demeanour was gentle and soft-spoken, able to express his strong convictions with a gracious civility,” Dr McMullen said. Members of various religious faiths attended. The local Catholic priest, Fr Seán Nolan, a life-long friend of Mr Crawford, read a lesson during the funeral service. Enterprise Minister, Heather Humphreys, led tributes to her old political mentor whom she had succeeded on Monaghan County Council and later in Dáil Éireann. She was joined by other local representatives, Niamh Smith of Fianna Fáil, Caoimhgín Ó Caoláin and Fine Gael Senator Joe O’Reilly. A large group of former Fine Gael TDs were gathered from every corner of the country. They included former ministers, Nóra Owen and Alan Dukes, Tom Hayes, John Perry, Paul Bradford, Paul McGrath, Pádraig McCormack, Dinny McGinley, Louis Belton. IFA members from Co Monaghan and all over Ireland were led by their president, Joe Healy. President Higgins was represented by his ADC, Comdt Brian Walsh, and the Taoiseach by his ADC, Comdt Caroline Burke. Fine Gael secretary general, Tom Curran, also attended. 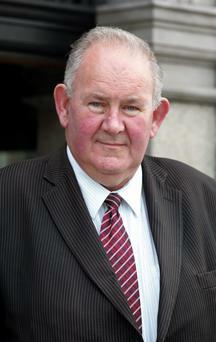 Mr Crawford was first elected to Monaghan County Council in in 1991. He was elected a TD in 1992, serving until his retirement in February 2011. He was praised by Fine Gael colleagues for his wry good humour as he uniquely offered a voice for Ulster Protestants at Leinster House. He was also an active member of the British-Irish Parliamentary Association, of which he was vice-chair. In his eulogy, Rev Colin Anderson, said Seymour Crawford was a true believer in public service and promoting community development and unity. He noted that he was also devoted to his late parents and his older siblings who had pre-deceased him.